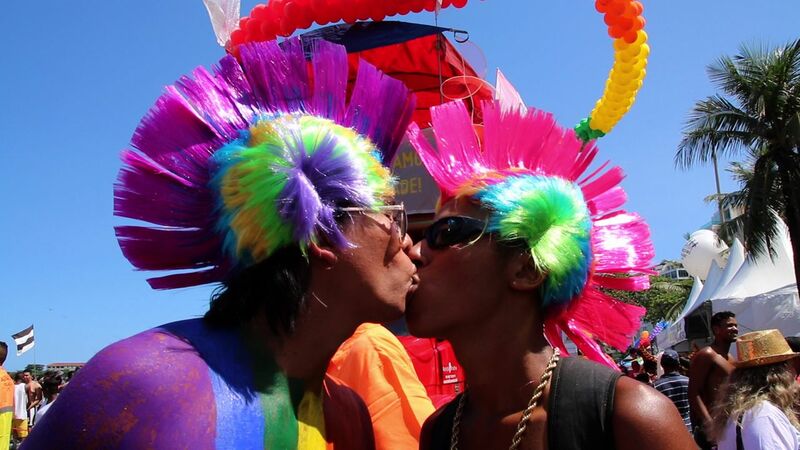 Whether you’re celebrating Carnaval, Pride or just looking for a good time, these LGBTQ hangouts are where the party’s at in Rio. Are you sick of meeting people on Bumble, Tinder, Grindr or in your dreams when there is a whole world out there? Perhaps you’re ready to sweep someone off their feet with your charming personality and Bruno Mars-inspired dance moves? Well, Rio de Janeiro is the perfect destination to meet people the old fashioned way. Walk the streets and catch a friendly smile or sit on the glamorous beaches and wait for that gorgeous guy with the banana hammock you’ve been checking out to ask if you can watch over his things while he takes a dip in the water. And if you’re gay, even better! Rio is pretty much the Latin American LGBTQ capital, and pride is everywhere from our iconic beaches to seductive bars and beyond. And if you’re straight, that’s great too! This is Rio after all, and all ends of the sexuality spectrum make it their duty to ensure foreigners have a good time while in their city. Brazilians are a friendly sort, hungry to practice English and teach visitors their sassy samba moves. So don’t be afraid to make eyes at that hottie on the beach because even if he doesn’t like you, he will probably have an equally attractive friend who does. 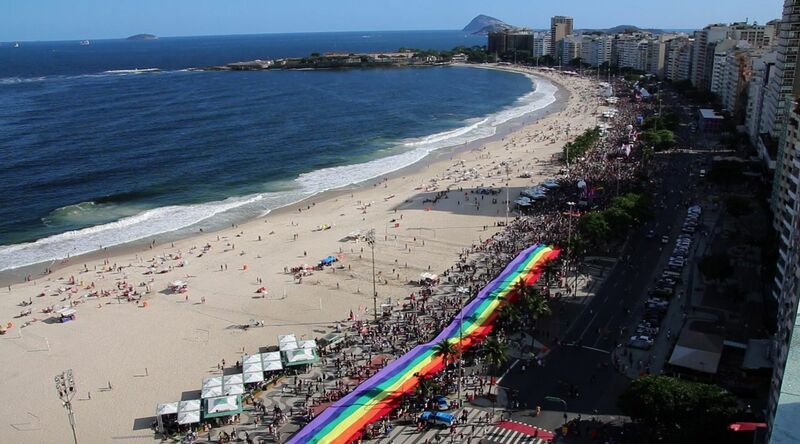 Though it may seem like Rio celebrates pride year round, the official Gay Pride Festival is held each November on Copacabana Beach. The highlight of the festival is the Gay Pride March. Thousands of people attend—most of them half-naked—and the festivities also include shows by drag queens and DJs. On Farme de Amoedo Street in Ipanema, the fabulous party doesn’t stop ‘til the next day. That’s not even mentioning the fact that after the march, there are parties all over town. Different neighborhoods of Rio also have their own (smaller) gay pride parades. The more suburban replica of the event in the North Rio neighborhood of Madureira is a good alternative to the main celebration in Copacabana. The slightly more relaxed atmosphere is perfect to further immerse yourself with the local flavor through music and dancing (OK ... twerking) in the streets. After the march, the neighborhood club Papa G's party spills out into the street, inviting everyone to join the Pride celebrations. This Copacabana cutie could be you ... or yours. Chances are, you’ve heard of Carnaval, but what you may not have heard is that Carnaval is pretty gay. And the gay celebrations start way before anything official even begins (what can I say, we’re Latin and gay and love to party). Stop by a samba school, where teams are always rehearsing, and LGBTQ pride reigns as supreme as Madonna. Don’t believe me? Head to the Mangueira samba school, take a class and while you’re there, check out the transgender restrooms. During Carnaval, as Cole Porter said, “anything goes.” Be prepared for drag queens, overly indulgent and colorful parades along with all sorts of unimaginable shenanigans. Pro tip: Don’t forget to bring your camera. You can check out one of the several gay-themed parades such as Bonitos do Corpo (“beautiful bodies”), a tribute to Brazilian beauty and the human form. You can also hit the streets at Banda de Ipanema for some certified fabulously gay street parties. From there, head to the Sambadrome, the epicenter of Carnaval celebrations. Here, samba schools compete during the one of the biggest open-air festivals in the world. Most of the schools make tributes to gay icons as they parade through the streets. In fact, many attendees—LGBTQ or otherwise—hit up this parade with the singular intention of kissing as many people as possible. If you want to walk around in flip flops, see the sunset at Arpoador and catch rays at the gay beach (located at the end of Rua Farme de Amoedo), then staying in South Rio is your best bet. When the sun goes down, here are some places to find someone to bring back to that hotel room of yours. Visit this tiny club and bar in the red light district of Copacabana if you love themed parties and loud music. Do: Make sure it’s a gay night when you visit, and you will find a young crowd devoted to rock and hip hop. Don’t: Don’t attend a Fosfobox party if you’re claustrophobic and can’t handle your fellow dancers’ sweat mixing with your own. Le Boy rose to fame for having all that your beautiful gay heart could want: a sauna upstairs, a couple of bars, gogo boys and drag shows. It’s location between Ipanema and Copacabana is also ideal for those who don’t want to travel too far to find some fun. Do: Visit the sauna on the top floor. Entry to the club is free after you visit the steam room to unwind and who knows what else. Don’t: Expect to find a crowded club. Le Boy has seen better days but even though it’s not the club it used to be, it still hosts superb drag shows and special events worth your while, especially during Pride and Carnaval season. This posh dance club and restaurant with an outdoor terrace hosts a gay night every Sunday. Gávea attracts a sophisticated, upscale crowd—specifically the residents of the high-class Leblon and Ipanema districts. Do: Dine at their restaurant and enjoy a few drinks while listening to live music before dancing until ungodly hours. Don’t: Forget you have to pay at the end. Like many Brazilian clubs and restaurants, you receive a card upon entering that tracks your purchases. You must present it with each drink purchase, and if you lose the card, be prepared for your wallet (and your soul) to cry in expensive distress. Into themed parties in intimate spaces? Fosfobox is for you. Pardon? I couldn't hear you over the hype. Rio’s city center, also happens to be its eternal party district. On Friday and Saturday, the neighborhood becomes an epicenter of live music and street party madness where people from all walks of life come together to dance to the beat of the same drum. At the beginning of Mem de Sá street, a bunch of fellow gays meet up before venturing out for a night full of festivities. Oftentimes, there’s enough happening in the streets to fulfill your wildest party needs. 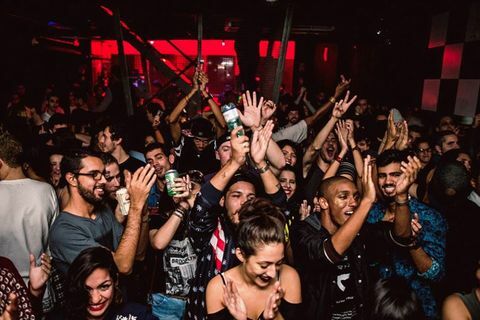 The Week is not so far off from its Sao Paulo sister, the biggest gay club in Brazil. It’s one of the best clubs in Rio with multiple bars and an outdoor terrace, which features a swimming pool. Do: Follow the crowd. Take your shirt off if the opportunity arises. Don’t: Expect exciting conversations. The Week is that place to see and be seen. A fancy club with an international vibe where cariocas (Rio locals) go to take adorable selfies and show the world how cool they are. One of the newest gay clubs on the scene in Rio happens to be located in a former women’s detention center. The owners must have liked the punishment-heavy atmosphere and decided to keep the cells … because why not? It has two different dance floors and the DJs love to put on a show that goes above and beyond the standard club gig. Do: Try the diva’s drinks. The most popular one honors our Queen: Beyonce. It is made with Jack Daniels, passion fruit and sugar. Don’t: Get there too early … because everyone else is, and there will be a massive line. It is better to pay a little more and arrive late than getting trapped in what feels like a never-ending queue. Four years ago, after succumbing to the lure of Carnaval, Barcelona-born Edgar Costa fell in love with Rio and started a new life as a correspondent for Ruply and El Mundo. Since then, Edgar has published several travel books and guides. The Week International is an after hours LGBT nightclub located in the city of São Paulo, Brazil. Loud music and entertaining shows in popular gay nightclub, with spacious dance floor, mezzanines and sauna. Leblon is the most affluent neighborhood in Rio de Janeiro, Brazil. Neighboring Ipanema is regarded as the second most affluent area in Rio de Janeiro. Electronic music, rock'n'roll, pop and hip hop at club that also has theater and other art forms. LGBT nightclub with different shows and live music, resident DJs and promotions offering free drinks. Madureira is a neighborhood in the North Zone of the city of Rio de Janeiro, Brazil. Its population is basically middle class and lower middle-class, including some shanty towns. Ipanema is a neighbourhood located in the South Zone of the city of Rio de Janeiro, Brazil, between Leblon and Arpoador. Copacabana located in the South Zone of the city of Rio de Janeiro, Brazil. It is known for its 4 km balneario beach, which is one of the most famous in the world. Mangueira is a neighborhood in the city of Rio de Janeiro, Brazil. A hybrid design combining an outdoor garden with a trendy restaurant & modern dance floor.